Bérénice Bejo (French pronunciation: ​[be.ʁe.nis be.ʒo]; born 7 July 1976) is a French-Argentine actress best known for playing Christiana in A Knight's Tale (2001) and Peppy Miller in The Artist (2011). Her work in the latter received her a nomination for the Academy Award for Best Supporting Actress and won her the César Award for Best Actress. She won Best Actress at the Cannes Film Festival in 2013 and was nominated for a César for her performance in The Past. Bejo was born in Buenos Aires, Argentina, and is the daughter of Argentine filmmaker Miguel Bejo and his wife Silvia, a lawyer. When she was three, her family moved to France, escaping from Argentina's last civil-military dictatorship (1976-1983). In 2003, Bejo starred as Olivia in 24 Hours in the Life of a Woman by Laurent Bouhnik. Under the direction of Steve Suissa, she seduces Stephane Freiss and Titoff in The Grand Role (2004), and a comedy about the world of actors, and Cavalcade (2005), a drama dealing with the theme of disability. In 2006, she made a comeback by acting alongside Jean Dujardin in OSS 117: Cairo, Nest of Spies by Michel Hazanavicius. This was the first collaboration of the trio. In 2007, she made an appearance in the short film La Pomme d'Adam. In 2008, she appeared in two romantic comedies: Modern Love Bouquet and Stéphane Kazandjian. The same year she gave birth to her first child by Hazanavicius. In 2009, she participated in the documentary by Serge Bromberg [fr], Henri-Georges Clouzot's Inferno. The documentary reconstructs Clouzot's film, alternating between scenes from the 1964 film and dialogue readings between Jacques Gamblin (for Serge Reggiani) and Béjo (for Romy Schneider). In the 2011 film, The Artist, which is directed by Hazanavicius and stars Dujardin, Bejo plays Peppy Miller, a 1920s film actress. Her performance received critical acclaim, the César Award for Best Actress, and several award nominations: the Screen Actors Guild Award for Outstanding Performance by a Female Actor in a Supporting Role, the Golden Globe Award for Best Supporting Actress – Motion Picture award, BAFTA Award for Best Actress in a Leading Role and the Academy Award for Best Supporting Actress. In 2012, she was announced as the host of the opening and closing ceremonies at the 2012 Cannes Film Festival. She dubbed the role of Mérida in the French dub of the Disney/Pixar film Brave. In June 2012, Bejo was invited to join the Academy of Motion Picture Arts and Sciences. The same month, she received the Prix Romy Schneider. ^ Diego Lerer (13 March 2003). "Estaba peleado con el país". Clarin (in Spanish). Retrieved 28 February 2012. ^ Gabriel de Lerma (17 February 2012). "Bérénice Bejo, en la cima de la popularidad". El Nuevo Herald (in Spanish). Archived from the original on 28 February 2012. Retrieved 28 February 2012. ^ Agence France-Presse (25 January 2012). 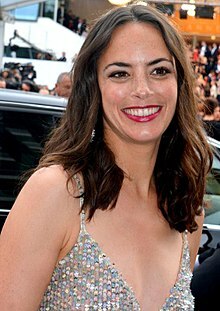 "Bérénice Bejo se sent 'aussi Argentine que Française'". La Dépêche (in French). Retrieved 28 February 2012. ^ a b Scott Feinberg (8 February 2012). "Bérénice Bejo, Silent Star of The Artist, Talks About the Two Leading Men in Her Life". The Hollywood Reporter. Retrieved 12 February 2012. ^ "The Artist wins six César awards". The Telegraph. 25 February 2012. Retrieved 28 February 2012. ^ SAG awards list, sagawards.org. ^ Golden Globes list Archived 29 October 2012 at the Wayback Machine, goldenglobes.org. ^ "Academy Invites 176 to Membership" (Press release). The Academy of Motion Picture Arts and Sciences. June 29, 2012. Retrieved July 19, 2013. Wikimedia Commons has media related to Bérénice Bejo. This page was last edited on 5 March 2019, at 13:58 (UTC).